On startup of the 7th IDE at least two windows will open. The one with the toolbar is the editor. If You are working with files that have the extension .7th a code beautifier handles the correct identation of the program lines and control words are highlited in magenta. Of course You can edit any kind of text files. Unlike other editiors You are not forced to give an entered program or entered text a fliename at once, before closing the 7th editor. You get the last file You had created on re-entering the editor. 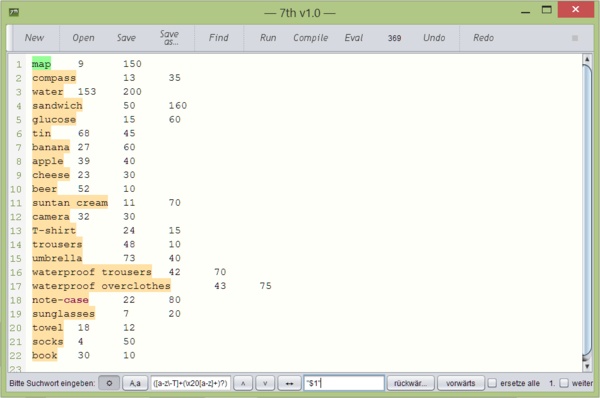 With the 7th editor a lot more than the usual simple text replacement is possible. In the present example we will surround each text with quotes. [a-z\-T]+ find all words with at least one letter containing a-z, the hyphen and T (for the T-shirt). The hyphen is a functional symbol in regular expressions and must be escaped therefore. To get the matched text into quotes use: "$1" where $1 ist substituted with the matching text of the 1. brace level. The use of the 7th editor is much more comfortably than those of the command-line editors. And CTRL-C / CTRL-V (cut and paste) works between computers while accessing remotely. A new file without an extension is created by setting Files of Type to All Files in the Save-dialog. Otherwise an .7th extension is appended by default.